At 90 Don Lumsden of Boca Royale subdivision in Englewood, Fla. has the distinction of being the oldest living “Frogman” in the United States of America. He learned about this honor a few days ago from Mike Howard, Director of the Seal Museum in Fort Pierce, Fla.
“He called me the other day and told me, ‘A group of us were trying to figure out who was the oldest ‘Frogman’. It didn’t take us long to figure out it was you,'” Lumsden said. 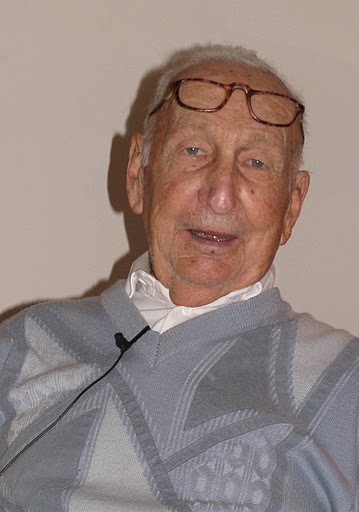 He joined the Navy in 1943 while attending Northeastern University in New Hampshire. After Naval officers training, Lumsden wound up in Fort Pierce and became a “Frogman” all because he was a good swimmer. The training was brief and tough. Those who graduated took a boat to Maui, Hawaii for advanced training. After graduation his group became Underwater Demolition Team 11. Almost immediately they were part of the invasion fleet for the Battle of Iwo Jima. Lumsden and his fellow “Frogmen” hit the beach at Iwo to check for underwater obstacles and water depth before the Marines went ashore. During the Tarawa invasion earlier, Marines hadn’t surveyed the landing beach before they invaded. As a consequence, they paid for it with the lives of scores of dead “Leathernecks” who drowned when they stepped off their landing crafts into deep water, or their boats hit submerged obstacles. After the Tarawa fiasco all invasion beaches were inspected by UDT teams before the assault. With nothing more than a pair of flippers, a mask, a knife and some explosives, Lumsden and his fellow “Frogmen” were dropped two-miles off the beach and told to reconnoiter and clear the way for the invasion force. During the Battle of Iwo Jima, he was hurt when the explosive they were using unexpectedly detonated injuring several in the advanced party. Lumsden recovered in time to take part in the Okinawa invasion, the largest island battle in the Pacific during World War II. However, it was the island of Borneo, his third landing, he remembers best. “Our explosives were in haversacks. They were in sticks with fuses sticking out the top. Our job was to put a stick around each piling obstruction the Japanese had buried along the shore to stop the Allied landing craft from coming ashore,” Lumsden recalled. Each charge was connected to a single cord attached to a detonator they hooked up off shore on the way back to their ship. Once they blew up the Japanese beach obstructions the “Frogmen” were picked up as they bobbed in the sea by a high speed boat. “The first night off Borneo, after we had gone ashore and checked out the beach we had to meet with MacArthur and brief him on what we had discovered about the landing beach.” Lumsden said six decades later. “Here I am telling the greatest general in the whole world he should change his invasion plans based on what we had discovered about the beach, and he did. Lumsden holds the flippers, mask and knife he used during the invasions of Iwo Jima, Okinawa and Borneo when he served as a “Frogman” in World War II. Lumsden received a Bronze Star for clearing obstacles from the invasion beach at Borneo and providing the Supreme Allied Commander in the South Pacific details about the condition of the shoreline. “The President of he United States takes pleasure in presenting Lt. j.g. Donald James Lumsden, USN Reserve, the Bronze Star for his heroic accomplishments as Section Leader during the invasion of Balikpapan, Borneo, June 26 to 30, 1945. In 1989 Lumsden and his wife, Brenda, moved to Boca Royale to retire. This story was first printed in the Charlotte Sun newspaper, Port Charlotte, Florida on Monday, Jan. 9, 2012 and is republished with permission. Click here to view Lumsden’s Collection in the Library of Congress’ Veterans History Project. The following story first appeared in the Charlotte Sun newspaper, Port Charlotte, Fla. on Friday, June 7, 2002 and is republished with permission. 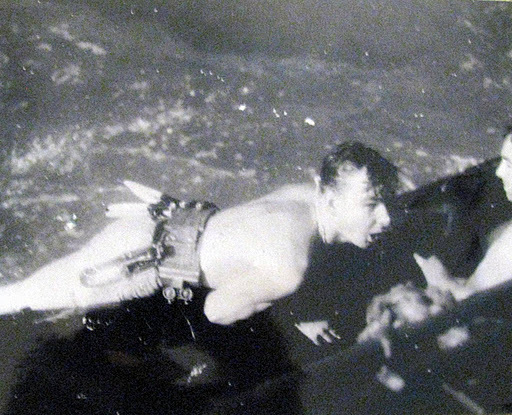 Don Lumsden was a frogman who participated in the last battle of World War II. It was the invasion of Brunei Bay off the island of Borneo on June 8, 1945 — two days after the atomic bomb was dropped on Hiroshima. A member of Underwater Demolition Team-11, the 80-year-old Englewood man took part in the invasion, even though Australian troops did most of the fighting. Lumsden was a graduate of Cmdr. Draper Kauffman’s UDT school in Fort Pierce and his advanced UDT school in Hawaii. The commander founded the Navy’s UDT program during WWII. After the disastrous invasion of Tarawa, a minuscule atoll in the South Pacific, in which hundreds of Marines died for lack of advance reconnaissance, the Navy decided that before any more island invasions, frogmen would be sent in to reconnoiter. “After the calamity at Tarawa, every invasion in the Pacific was preceded by UDT teams. They would go in, check out the situation and blow up the obstructions,” he said. “We swam into Brunei Bay. Like Okinawa and Iwo Jima, the Japanese had a series of underwater hard wood pilings about 8 to 10 inches in diameter pounded into the coral bottom to block our landing craft from reaching shore,” Lumsden said. Their job was to clear the underwater obstructions. Initially, they swam into shore from approximately a half-mile off the beach clad in bathing suits, flippers and masks and carrying knives. In addition, they had a Plexiglas plate to write underwater notes on as well as mine detonators and timers. They had no wet suits or scuba tanks, not even a snorkel. Their faces were painted silver to make them less noticeable to the enemy when they broke the surface to breathe. “The thing that saved us was the fire power. At 1,500 yards offshore, we had LCFL (Landing Craft Support Large). They had six quad 40 mm guns on them. At 2,500 yards there were two or three destroyers. At 3,500 yards there were two or three cruisers. And at 5,000 yards we had two or three battleships. The Japanese apparently didn’t realize the important part the frogmen played in clearing away the underwater obstructions to the invasion beaches. Lumsden said 98 percent of his group survived despite the hazards of the occupation. In the Borneo invasion he lost one of his men to friendly fire. A B-24 flew over and dropped a bomb in the wrong spot. Several other members of his UDT team were hit by enemy fire, but they all managed to return to the pickup area. The way it worked, frogmen would swim in and reconnoiter the area the first day to determine what would be needed to clear a path to the beach for the landing crafts. The following day they would bring in plastic explosives in 2 1/2-pound chunks. A piece of primer cord would be attached to each block of explosive. They would also have a cord on the explosives to tie them to the underwater obstructions. Each charge would be connected to a main primer cord that ran out to sea. Off the beach, a couple of fuse lighters were stationed in a rubber boat. It was their job to explode the connected charges by lighting a single primer cord when the time came. At Brunei Bay, Lumsden had to report to Gen. MacArthur. “Two other officers and myself briefed him on the pending invasion of the island. We went aboard his cruiser; I think it was the ‘Columbia.’ We were ushered into his war room. “It was something. MacArthur was very distinguished and very, very polite to us,” Lumsden said. “He complimented us on what we had done so far clearing the obstructions prior to the invasion. “I guess under different circumstances I would have been shaking in my boots. But I can remember telling MacArthur that I had been swimming into the beaches and I felt that the brown designated beaches were better than the green beaches for landing craft. He thanked me and took my suggestion when the invasion was launched. Lumsden and his UDT team were originally scheduled to be the point team during the invasion of Iwo Jima, a few months earlier. But his entire group was injured in a practice invasion just before the real thing and temporarily put out of commission. They were back in shape and ready to hit the beaches just days before the April 1, 1945, Easter Sunday attack on Okinawa. The pilings came all the way up to the shore. They had to attach plastic explosives while almost lying on the beach, trying to stay concealed behind the 10-inch-in-diameter pilings. The young sailor stood in harm’s way. The Japanese had opened fire with everything they had. Conrad was a brave man, he said. “Those were the days of the Kamikazes (Japanese suicide pilots). Our destroyer just missed being hit by one. A cruiser near us was hit and went up in flames,” he said. After they secured the harbor at Nagasaki, they were sent on patrols. At one point they freed a group of American prisoners who had been used as slave laborers in Japanese coal mines near the devastated city. “I don’t think they had seen the light of day in months,” Lumsden said. “They were 50 or 60 pounds underweight. They staggered out and put their arms around us,” he said. The following story first appeared in the Port Charlotte Sun, Port Charlotte, Fla. on Thursday, May 13, 2004 and is republished with permission. Don Lumsden and Alan Voorhees didn’t look much like the big, bad Underwater Demolition Team dudes they had once been some 60 years ago at the end of World War II. They appeared to be a couple of elderly men enjoying their lunch at the Boca Royale Country Club in Englewood with Art Nicholas, a old U.S. Navy scout and raider buddy. As young lieutenant Frogmen a long time ago, they reconnoitered some of the most historic enemy beaches in the Second World War — Okinawa, Nagasaki and Brunei Bay, off the island of Borneo. They were also scheduled to lead the assault at Iwo Jima, but their unit was decimated just before the landing and had to abort that invasion. It was the job of Lumsden and Voorhees to check out the landing beaches before the Marines made their assault. Their UDT team cleared underwater obstacles and mines from the path of U.S. landing craft full of Marines that would hit the beaches hours later. They also provided a detailed map of the bottom and the shore for the officers in charge of the assault to use in planning their pending attack. The U.S. Navy got serious about the need for UDT teams to check enemy beaches after the calamity at Tarawa. The tiny Pacific island was a disaster for the Marines who made the assault blind and encountered crushing enemy resistance. One of the primary reasons for the snafus at Tarawa was that they hadn’t used Frogmen to check the terrain out first to see what the Marines would be facing in the way of enemy fortifications before they landed. They didn’t make that mistake again. From Tarawa on, the Navy’s Frogmen hit the invasion beaches before the Marines showed up. It worked a lot better that way. That’s all ancient history. What Don and Alan were doing at the Englewood club a few days ago was getting reacquainted after almost six decades. Over the years Don had done pretty well for himself with his own textile business. Alan owns a brokerage business and is still flying around the country in his 80s still making deals. They had long ago lost track of each other. Both assumed the other was dead until Don happened to spot Alan’s name on a quarterly newsletter produced by the Navy Seal Museum in Fort Pierce. Alan was listed as a contributor to the museum. It used to be called the UDT Museum until its name was changed because directors said the general public didn’t have a clue what UDT meant. That didn’t go down well with the old Frogmen, the predecessors of today’s Seals. When Alan’s secretary came on the phone he asked to speak to him personally. His secretary inquired what business he had with the president of the firm. In no time Alan was on the line. He was more surprised than his secretary that he was talking to Don Lumsden, his long-lost war buddy. They chatted for some time. Alan told him he was planning a business trip to California in a couple of weeks. On the way west he could fly into the Sarasota Airport and they could renew their acquaintance. Don thought that was a great idea. That’s what they were doing at the Boca Royale Country Club. They were comparing notes about their war experiences. The two old warriors were trying to piece together what they could remember of their World War II happenings. Art was in on the meeting because he had been part of the staff at the UDT school in Fort Lauderdale about the time the two Frogmen were taking their training there. Furthermore, he is a friend of Don’s who lives on Manasota Key. The two old UDTers took out several original maps Don still had at home of some of the landing sites they made. They chewed over the fact that their UDT unit went into Okinawa in late March, three days before the April 1, 1945, Easter Sunday Marine landing that launched the largest battle for the Leathernecks during the Pacific war. They went in before the Marines again at Brunei Bay, along the coast of Borneo, on June 10, 1945, roughly two months before the Japanese surrendered. The Marines were attacking Balikpapan, Borneo, the Japanese oil supply center. Immediately after the war, Don and Alan were sent in to scout out the underwater mine situation in the harbor at Nagasaki, before the American fleet dropped anchor. They found no mines in the harbor, but what they found on land was appalling. Don just kept his mouth shut. He wanted to get a word in about his swimming ability because he took issue with Al’s assessment of the rest of the UDT team’s swimming expertise as compared to his swimming prowess. However, Don said nothing. Donald James Lumsden, 90, of Englewood, formerly of Dover, Mass. died Feb. 20, 2012. Inurnment will be in New Hampshire at a later date. Englewood Community Funeral Home is in charge of arrangements for cremation. Survivors include his loving wife of 65 years, Brenda F. of Englewood; daughter Diana J. of Newbury, N.H.; son Dale B. of Yarmouthport, Mass. ; and two grandchildren, Janis Roberto and Moira Yon. A U.S. Navy veteran of World War II he was a proud member of Underwater Demolition Team 11 and participated in both the Iwo Jima and Borneo invasions. Don was the President of Andrew Fabric Corporation, a textile manufacturing company in Needham, Mass. He retired in 1984. He was a member of the Needham Rotary Club and the Needham Golf & Country Club and a former President of the Boca Royal Golf & Country Club and a club champion. Memorial contributions may be made to Tidewell Hospice, 5955 Rand Blvd., Sarasota, FL 34238. My dad trained frogmen at Fort Pierce from 1944 to March 1945. He always said the men hated him for the first week and adored him by the last day of training. He would tell them he didn’t care whether they liked him or not, as long as they left ready to succeed in dangerous missions and survive. Thank you for sharing that information about your dad. I wonder if he trained Don Lumsden. Well then Mr. Lumsden has my grandfather beat by three months for being the oldest living Frogman. My Grandfather’s birthday is in March of 1922. Just noticed that the last post was two years old. Mr. Lumsden died a couple of months or so after that interview. My father Emery Husvar 91 years old was also a frogman in WWII. He’s currently in a nursing home in PA. He was in the Mediterranean primarily on a subchaser SC 693. Would you or someone else on here know where I could find information on my father, also a frogman still living in PA. UDT unit aboard subchaser 693 took part in operation Dragon, southern France.He just turned 91 on Christmas Day 2016. First off, your father should have a DD-213 (discharge paper) somewhere. Every veteran was issued one. It tells a lot about their service record. If you can’t put your hands on that, then check out this site: https://www.archives.gov/veterans. There are websites devoted to various military groups – you might poke around. I’m sure you researched Operation Dragon? You might want to contact the Navy Seal Museum in Fort Pierce, Fla. https://www.navysealmuseum.org or their data base: http://navysealmuseum.pastperfectonline.com. The only thing like that I have is a notice of separation paper: Navpers-553 (Rev.8-45) which I think may be the same as the dd213 you refer to. It lists all dates, as well as some vessels and stations he served. The commanding officer is listed as W.D.Phillips. Thank you again and I’ll see what I can find off the places you suggest. I wonder if I can find if he is accurate about truly being a frogman as he said he didn’t remember ever being trained in Florida. He says Montauk,NY, Norfolk,VA., Shoemaker,CA. is where he says his training came from. He says trained in reading sonar,radar, and underwater bomb placement and removal. Navpers is the equivalent of a DD-214. Frogman training happened in more than one place – so I wouldn’t dismiss what he tells you. Keep in touch with what you find. Will do.Thankyou so much.I take him out for lunch every Saturday, and my father enjoyed looking at photos from links of websites you recommended,he also said thank you. My father has given my siblings and I silver rings he bought each inscribed with places He went and ,Oran Africa, as well as a few between France and Italy. He did say They took part in a battle at these places one he spoke of was Salerno. My uncle William Oliver Bodeker was a frogman in early Vietnam. He died yesterday March 17, 2018. 4 tours and there for the final evacuation. I would like to find out more about his service, any suggestions? Ask his wife, children — whomever — for a copy of his DD-214 – the official discharge papers that’s issued to every service personnel. He should have had that in his possession as it’s direct proof of his service. That will give you his unit, commendations, other information. There are numerous sites you can follow – if you’re on FaceBook, as well, and some allow you to ask questions. Important to find out his unit. Let me know if I can be of further assistance.